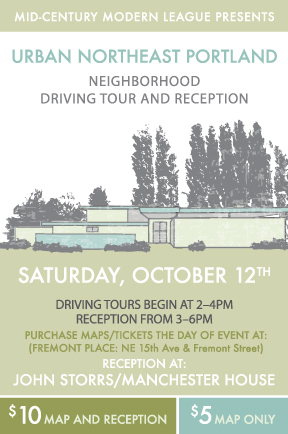 Join us Oct 12th for our second annual Mid-Century Neighborhood Self-Guided Driving Tour & Reception! This year we share our favorite examples of mid-century houses and neighborhoods from Urban Northeast Portland, with the tour ending in a reception at a marvel of Mid-century Architecture by Architect John Storrs! MAPS/TIX: Purchase maps and tickets on Oct 12 from 2-4pm at the Fremont Place Shopping Ctr @ the corner of NE 15th and Fremont. Tour Map is $5 per group. Reception (includes map) is $10 per person. RECEPTION: The tour will end with a reception at a recently verified John Storrs1963 Mid-Century Modern home in the area. This will be your first chance to see this home for yourself! We will have a display of historical information on this house and that of other houses on tour. Address will be given w/ purchase of map. Reception is from 3-6pm. Reception + Map is $10 per person. Grab a friend and see you then! MAY 12 - MCM League will host our Northeast Portland Mid-Century Neighborhood Tour. 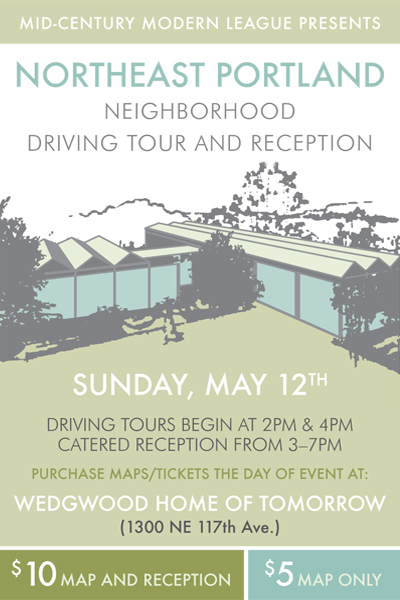 It’s a self-guided driving tour through some of our favorite mid-century neighborhoods, detailing architects and builders of notoriety, and finishes with a catered reception at the 1958 Wedgwood “Home of Tomorrow”, designed by Blair and Fletcher! You won’t want to miss this! Sunday, May 12, 2013. Bring Mom, it’s a great way to spend Mother’s Day! Price: $10 for Map & Reception, $5 for Map only. Tours: Driving tours begin @ 2pm or 4pm. Tour takes approximately 1 to 1.5 hours. Purchase Tickets: @ 1300 NE 117th (Home of Tomorrow), 2 – 4:30 pm. Reception: Come back to the Home of Tomorrow at end of tour for a catered reception from 3-7 pm. We hope to see you at all three events! Make a weekend of it!! May 11th and 12th promise good things for the Mid-century enthusiast! 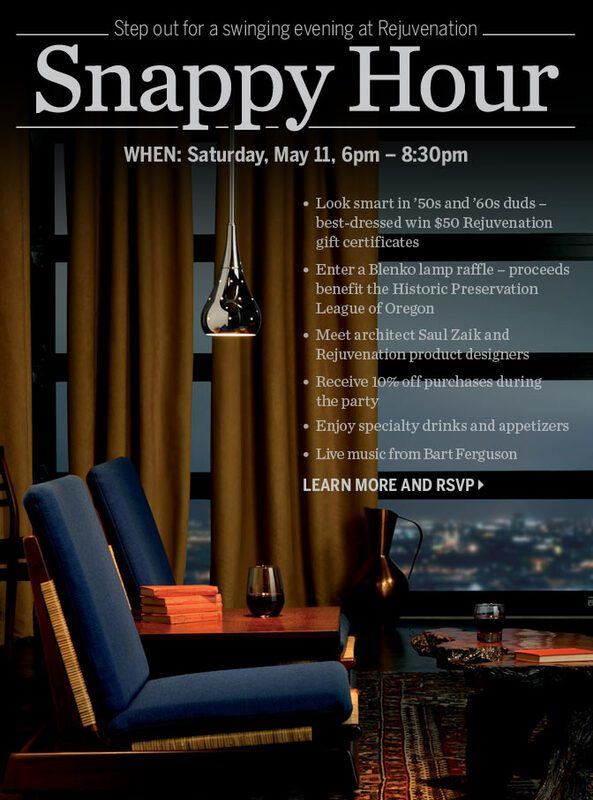 The HPLO, Rejuvenation Hardware and the MCM League combine efforts May 11th & 12th to bring you a sampling of Portland’s wealth of mid-century architecture! The Historic Preservation League of Oregon starts the weekend off with a tour of Saul Zaik Homes, all of which were chosen by Saul himself, and includes his personal home. The tour price includes a lecture on Saul Zaik and the Northwest Regional. Portland First United Methodist Church, Saturday, 10 am -4pm. Next, Rejuvenation Hardware gives you the opportunity to hob-nob with Saul Zaik, himself! The cocktail party “Snappy Hour” is free and open to anyone who RSVP’s. There will be mid-century themed raffle prize (an authentic Blenko handblown glass lamp, with proceeds benefiting the Historic Preservation League of Oregon), specialty drinks and appetizers, music by Bart Ferguson, and a contest for best 60′s clothing ensemble! Rejuvenation will also be offering 10% off purchase during party. Lastly, the MCM League will host our Northeast Portland Mid-Century Neighborhood Tour. In conjunction with HPLO‘s Mid-century Modern Tour of Saul Zaik homes, we’re hosting our Northeast Portland Mid-century Neighborhood Tour. It’s a self-guided driving tour that finishes with a reception at the 1958 Wedgwood* “Home of Tomorrow”, designed by Blair and Fletcher! *spelling of Wedgwood taken from Original Advertisement. 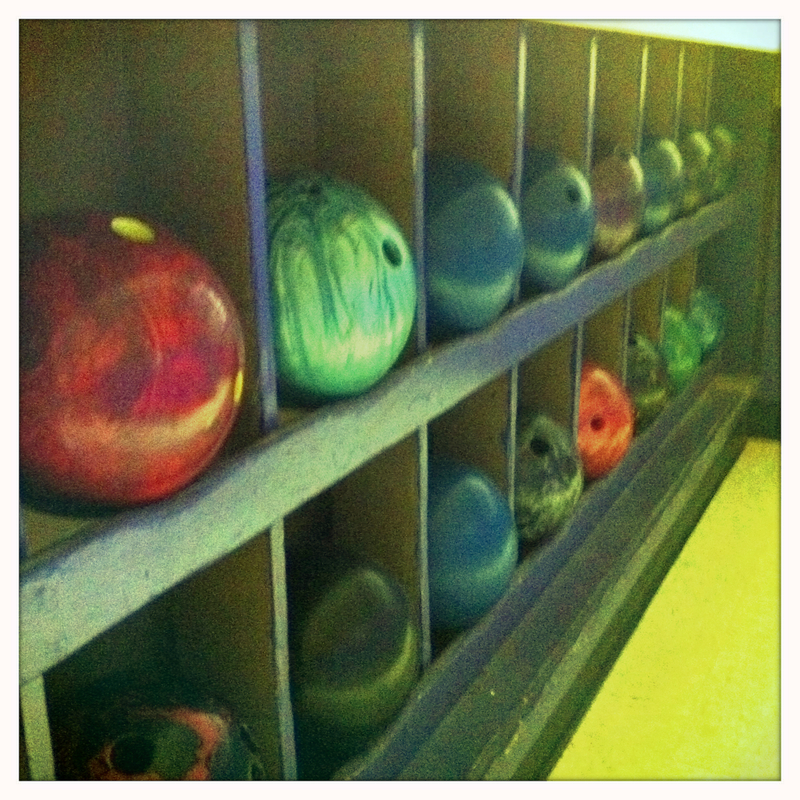 We’ve rented out the VINTAGE 1957 Elk’s bowling alley! Join us from 7pm-9pm on Friday, April 26th. Bring your friends – The more the merrier! We’ve rented 4 lanes, but can add up to 8! $4 per game, $2 for shoes. Feel free to bring potluck! The BAR will be OPEN!! Important Directions: Access the alley by parking on the left side of the Elk’s building and walking down the stairs, OR drive around to the lower level of the lot and park there. Do not bring Potluck through the Elks Lodge, just in through the Bowling Center Doors. Thanks!! November is going to be a fantastic meeting for the MCM League that you will not want to miss! Our meeting will be held at The Wedgewood Home of Tomorrow. Yes, the house with that awesome zigzag roof we’ve all been lusting after to see inside. This Mid-Century Modern classic was designed by Donald Blair and William Fletcher in 1958 as a display home for Wedgewood homes and won an AIA Merit Award in 1960. Wedgewood asked the architects to create a house of the future, pulling out all of the stops and reimaging past notions about residential design. The architects of the Home of Tomorrow found inspiration in the Modernist movement as well as the International Style. Taking a cue from the painter Mondrian they employed bold colors and geometric patterns that are scattered throughout the home and still current today. We will also have a guest speaker for this meeting Master Craftsmen Patrick O’Neill, owner of Greenline Fine Woodworking, will speak on how he has recreated the craftsmanship details of mid-century NW Regional style architecture of John Yeon and Pietro Belluschi using materials that are available today. Patrick O’Neil was the craftsman behind building the recent Belluschi exhibit that we visited in September. Meet, greet & viewing of the Home of Tomorrow will be from 5-6 pm. Tours of the Home of Tomorrow will take place during this time lead by the owner, Jeff Myers. Meeting is at 6pm sharp. League business will be addressed, officer voting will take place and our guest speaker will follow. This meeting will be a POTLUCK, feel free to bring a dish to share. The MCM League will provide mixers; you may bring your own adult beverage if so inclined. This event is open to everyone, not just official League members, so don’t miss it. Don’t forget to get your officer nominations in by email before our November meeting to [email protected] All officer positions are open for the year of 2013 and will be voted on during our November meeting. Join us for the August MCM League Monthly Meeting! *Please note*: the August meeting is unusual in that prior to the meeting we are offering a self-guided tour of many of the neighborhoods of deep NE Portland and ending the tour at our meeting place - a spectacular MCM Home – where we will also be having a pool party! The map will be sold from 3-4:30 for $5. 1245 NE 153rd Pl at 5pm. The meeting will start as usual at 6PM. Join us August 19th for the first of what we hope to be many mid-century neighborhood self-guided driving tours! 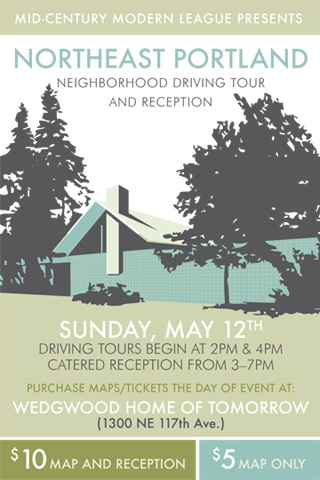 The EAST-PORTLAND tour takes you through several of our favorite deep NE mid-century tracts, points out houses by renowned architects and builders, and ends in a pool party at a fantastic specimen of Mid-Century Modernism! You can purchase a map for $5 from 3:00pm to 4:30pm at Hazelwood Hydropark on NE 117th & Holladay. This tour and party are open to the public, please tell your friends! NE 117th & Holladay (near the East Portland Neighborhood Office). Please join us for a midcentury-style potluck! This event is open to everyone, not just official League members, so don’t miss it. Diane and Jay Plesset have graciously invited us to host our holiday party at Evergreen, their beautiful custom-built, midcentury-inspired home in Oregon City. Diane is a designer with 25+ years of home building and design experience and the the host of “Today’s Home,” an internet talk show. She spoke at a recent MCM League meeting about her involvement in saving the Gordon House, Oregon’s only Frank Lloyd Wright home. This is a great opportunity to learn more about their design, home building and preservation work, and to enjoy their holiday hospitality! 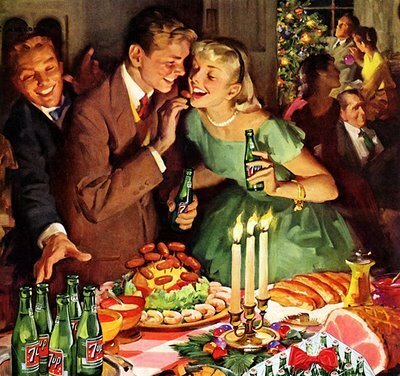 The party will also serve as our December public meeting, though League business for December will consist primarily of welcoming our new officers and enjoying ourselves. This is a BYOB potluck, so please bring your favorite adult beverage and bring a dish to share with the group. (This is also a fabulous opportunity to try your hand at creating your own Charles Phoenix-inspired Astro Weenie Christmas Tree! ).